Developing research suggests that autumn colors may be part of a tree’s defenses. As Greater Boston’s foliage season begins, we offer some new insight into why trees change color. Historically, it was thought that fall colors were simply a byproduct of dying leaves. 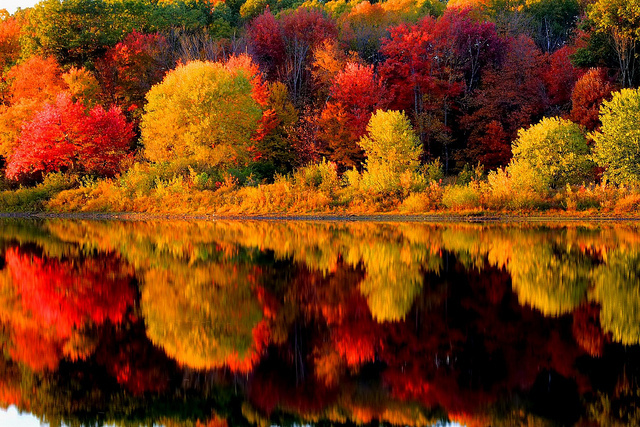 However, developing research suggests that autumn colors may have an expanded role helping protect trees. During spring and summer, leaves are green from a colored pigment, called chlorophyll, which captures energy in sunlight for photosynthesis. Leaves contain other pigments, but these colors are masked by the abundance of chlorophyll. A common belief was as chlorophyll breaks down during autumn, fall colors were simply the remaining pigments, unmasked by the absence of chlorophyll. During the fall, certain insects lay their eggs on trees. In the spring, the eggs hatch and the juvenile insects feast on their host tree. It has been theorized that the productions of brilliant colors essentially announce the tree’s lethality. Over time, insects have evolved to avoid bright colored leaves, and through natural selection, trees evolved to produce even brighter colors. Multiple worldwide studies have been conducted testing the legitimacy of this ‘signaling’ hypothesis. Preliminary results found that trees with bold fall colors did indeed suffer less insect damage. However, numerous details conflict with the leaf signaling theory. Namely, when bright autumn colors appear, insects that feed on foliage may not be present to warn. Red and orange colors, produced by pigments called anthocyanins, may protect foliage by blocking excess sunlight. Other research argues an alternative explanation suggesting that changing colors serve as a sort of leaf ‘sunscreen.’ As chlorophyll and other molecules necessary for photosynthesis are dismantled, leaves are inherently less efficient. Autumn leaves cannot capture all the sunlight available and any remaining energy can damage the leaf. Red and orange colors, produced by pigments called anthocyanins, appear to protect the leaf by blocking excess sunlight. Interestingly, evidence in favor of ‘leaf signaling’ actually supports the ‘sunscreen’ theory. The link between bright fall colors and a lack of damage in the spring may be a result of the trees doing a better job of protecting their leaves in preparation for winter dormancy. This new research and debate continues to raise questions rather than provide definitive answers. The discussion is an example of the complexity of tree physiology and lends deeper reverence for the beauty and wonder in fall foliage.